German Shepherd Dog Forums > The Puppy Place > Training Our Puppy (basic) > Crate/potty training -- how to recover? Crate/potty training -- how to recover? Things were going very well with the new puppy with crate/potty training. I got him use to his crate. He would go in without a fuss and whine really only if he needed to go out. Within a week or so he was sleeping almost through the night (6hrs or so) and things were good. Then Colorado got hit with the storm of the century. I've got drifts of snow measured in feet, the wind was (and still is) a constant 40-50mph all day with gusts 70+. I tried very hard to dig out areas so he could go outside to do his business but it was almost impossible with a 70 mph wind. I did get him to pee a few times but getting him to poop in those conditions proved to be impossible. In less than a minute he'd be shivering uncontrollably and fighting to get back inside. I knew it would happen but eventually he pooped all over his crate and himself. I cleaned both up but now it seems he doesn't respect his crate as a clean area anymore. I put him in after dinner (and after getting him to pee a bit outside) and checked an hour later. He had peed all over himself and the crate. This day from **** I can get over but I am worried I have lost the ability to use his crate as a means of potty training. I'm guessing that he won't whine tonight to go out he will just pee in the crate again. Has this ever happened to anyone? Is there an ancient dog training secret on how to get a puppy that was well on his way to being crate/potty trained back to respecting it? I've found it quite easy to potty train my dogs by being diligent with crate training. I'm not sure what to do without it. My gal started peeing in her crate so that I would take her outside. I figured that out after 2 days. From then on I took her our frequently on a schedule. (Alexa, set timer for 30 minutes) and if the crate was wet, I cleaned everything up and put my pup back into the crate. Going outside had become a reward for peeing indoors. I just read about the bomb cyclone that is hitting your state. I can't imagine how tough that is. You may want to set up a big box with pads for a pee station by your door for crazy weather. I might be tempted to teach a pup to pee in the shower if I had to deal with weather like that! At least that would be easy to clean. Not sure how I'd go about it, though. Or how to teach a pup to stop using the shower once weather improved. Thanks for the suggestion. We made it through the night without any accidents but I'm still on my guard. And yes the bomb cyclone--I love that is now a real weather term--was ridiculous for a March storm. This is Nikita, she's about 55 lbs for reference. I feel for you. We had a horrid Jan/Feb period and the ice has just thawed. Fortunately, both my dogs went out and did their business fast. My dog came to me at 5 months with no concept of potty training or what the outside was for. Thankfully, when I got him in December, we could stand outside until he peed/pooped each time, reward, go back in. I took him out hourly and all we did was potty training for the first 2 weeks-no real "walks." More indoor exercise to compensate. I made his crate as small as I humanely could and put his food and water in the crate. Remember, he was trained to use his crate for potty--it was gross when I got him. Anyway, I cleaned vigilantly when there was an accident--but honestly, given how bad it was, I'm shocked we haven't had *more* trouble. He's still excitement peeing in the house and will wet in the crate if his schedule is too disrupted (a late evening training class threw us off schedule and was tough to adapt to in the short run). He quickly stopped using his crate to potty for the most part, thankfully. He's 8 months now and I just stopped setting an alarm to walk him midway through the night (well, about 6 hours in). He's going 8 hours now and seems to be handling it well. Update and a few more questions. Nights are good. His last water is at 7pm. He consistently makes it 6 to 7 hours overnight, no accidents. I take him out immediately upon waking up and he goes outside as soon as his paws touch snow / pine needles. So that part has been great. During the day has been less great. Sometimes he does just fine for 90 to 120 min. But then sometimes he floods his crate after an hour or so. I'm really not sure where he is getting the ammunition. Here's what I am going to try next but I was looking for feedback. I am worried (as was suggested above) that he is peeing for attention and to get out of the crate. I have a 2nd crate I am going to place next to the first one. If he has an "accident" after just an hour, I am going to transfer him to the second crate, clean the first, and then transfer him right back. No baby wipe bath, no going outside, no attention. If he is quiet for a while I'll come back and take him outside and play / give him attention. My hope is he learns quickly that peeing himself doesn't get him anything other than being stinky for the day. Does that seem like that would help? This is just brain storming think outside the box so take it with a grain or two. Perhaps with the extreme conditions your pup has learned that outside potty is such a bad experience that he holds it at all costs. Maybe purchase a small doggie sweater and shovel a small path on your deck and create some kind of a three sided shelter type area so that going out is a bit more comfortable for him and less exposed to fridgid wind etc. perhaps seed the area with a soiled towel so he knows his scent in the area, maybe a bit of ground covering from your yard if you can get to it under all the snow. It's not an ideal set up on your deck but at least his outside experience may make it less of a drastic experience. Also that second create is a good idea just for the fact that he will be contained while you clean up the first but I would wipe him down immediately just for health reasons. I know you wouldn't keep him that way for any length of time but the sooner urine is cleaned from fur and skin, the less chance of other dirt or nasty bacteria can stick and take hold. We have experienced that amount of snow and it isn't fun dealing with it. 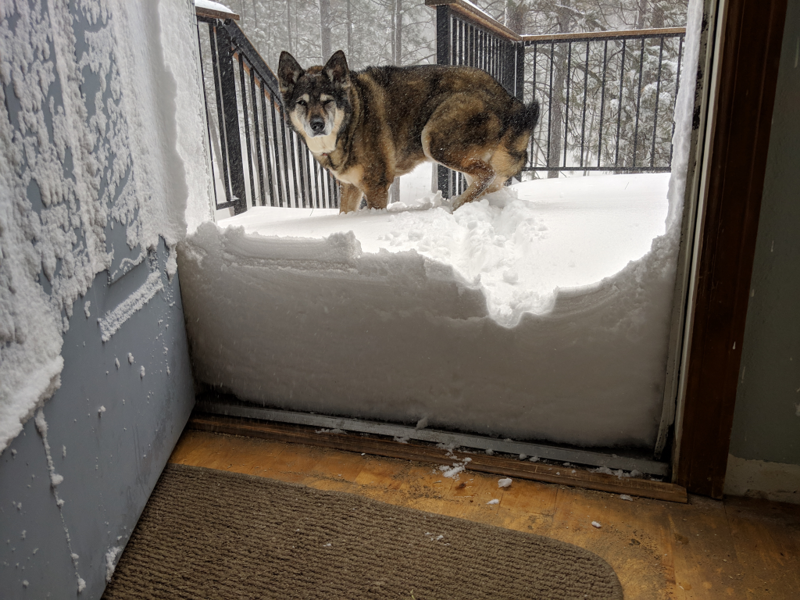 I hate admitting this but when we had two dogs at the same time and the snow was that deep and I was lazy, I let my dogs out on the deck to potty first thing in the morn. After my cup of Jove, I would go out and shovel it off. It got to be a seasonal pattern. Ok to potty on the deck when it snowed but not when the deck was shoveled or good weather came. I didn't even have to teach that concept both just made the connection on their own. Just some early AM thoughts. I was going to post a new thread but figured I'd just continue the saga here--hopefully the context will help. The short version is that I am close to losing my sanity trying to deal with crate issues. Codex has had a number of things disrupt his crate training and I am struggling mightily helping him recover. The first issue was the storm (see the post that started this thread). The second issue is that at 12 weeks, he had his first vet appointment and the stool sample came back from the lab with heavy Giardia. He got medicine for that (a 6 day course) so in theory that should be dealt with. The third issue is that I've been unable to find a food that gives him hard stools. I am loath to bring up food because of the whole Victor situation but he was on Victor and now is half Victor, half Fromm (both grain inclusive). I've yet to see a consistent hard stool and I've had him from 8 1/2 to 14 1/2 weeks. I don't know if it is the food or he is still recovering from the Giardia. (1) I am going to call the vet tomorrow to see if Giardia is still a possibility. But if not, how long does a puppy have to eat a food before you can judge whether or not it is going to work for them? I am happy to keep trying new brands / foods until his stool hardens but switching too quickly isn't going to be a valid test. (2) His last meal is at 5pm and last water is at 7pm and he makes it through the night fine. I was very hesitant to limit water during the day--it seemed overly restrictive. Would it be helpful (and healthy) to limit water during the day? (3) I'm open to any other suggestions. If I was not working from home I would have had to do what I did with previous dogs--come home at lunch time for outsides and play. That makes it 4 hours in the crate. I never had a dog have a single crate accident. This time he can't make it 2 hours consistently. Any other things I can try or should do? 2) Like you, I would hesitate to limit his water during the day... It might make him more likely to drink from puddles and unsafe water sources when you are out and about, and also it seems unhealthy and maybe uncomfortable for your dog? 3) Don't know! Maybe still unfeeling a bit unwell from the giardia? At 3-4 months, he should theoretically be able to hold it for 3-4 hours? Unfortunately maybe he got too used to going in his crate and thinks it's OK, ugh. My last thought is...and it's a horrible one...he could possibly pass Giardia to humans. So hopefully you are disinfecting and drying well!! I hope it resolves soon, you must be truly sick of cleaning up dog pee / poo. Well my vet prescribed 10 days of metronidazole. I was a little surprised an antibiotic helps with Giardia but it seems to be a very common approach. I still don't think this has anything to do with his peeing issues but taking it one day at a time.